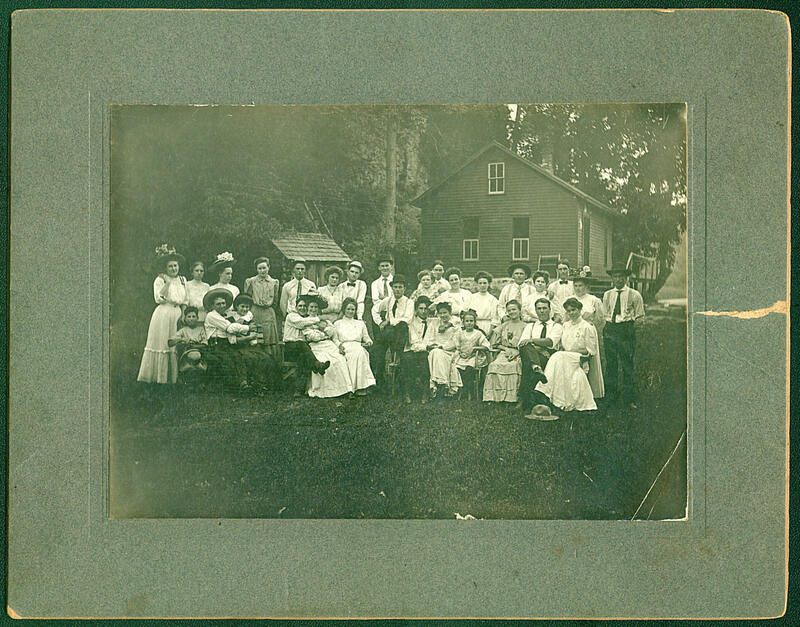 "This very interesting old photograph was passed down to me through my grandmother Bessie Emily Burgess Zadnichek (January 11, 1892 - September 28, 1961) who was born and raised in Bertram. My late uncle Albert Edward Zadnichek (November 29, 1923 - February 26, 1998), who spent his summers as a child at the Bertram home of his grandmother May Plummer Burgess (July 14, 1867 - December 29, 1960), identified this image as having been a Plummer-Stoneking Family Reunion somewhere in Linn County prior to 1900." 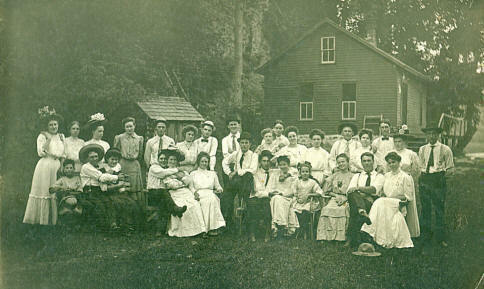 "The only person I can identify in the reunion group is my great-grandmother May Plummer Burgess seated in front at far right. Sitting closely alongside may be her husband Dr. William A. Burgess (August 6, 1855 - July 26, 1918) who was a Bertram veterinarian. Standing behind may be her parents, Civil War veteran and Bertram postmaster Milton B. Plummer (January 15, 1843 - December 18, 1914) and Charlotte Stoneking Plummer (November 23, 1846 - April 27, 1925). They were the parents of 12 children, Lizzie May; Sarah Ellen, born October 23, 1868 who married Frank Marks of Bertram; Edward, born September 29, 1870 who married Minnie Masingale; James H., born November 17, 1872; Celia B., born February 5, 1875, who married Edmund Thompson, a farmer of Linn Grove; William F., born January 20, 1877; Fannie, born January 6, 1879, who married Fred Lake of Springville, Linn County; Hattie, born February 15, 1881; Alice, born June 6, 1883, Statie, born July 19, 1885, Myrtie, born February 19, 1887; and Laura, born February 22, 1890." "Since my great-grandmother May Plummer Burgess was married prior to 1883 when her first child Alta Grace Burgess (November 1, 1883 - October 27, 1967) was born, this image might date from the 1880s which would be consistent with the clothing style worn by the family members. You can spot many of the Plummer family by their flat noses, a trait that continued into later generations. From all the smiling faces and young ladies being "squeezed" by their boyfriends or husbands, it looks like everyone was really enjoying themselves on a warm summer day. The exact Linn County location is unknown, but there appears to be a river or other body of water in back of the large timber structure. If you look very closely at the enlarged image, there is even a "ghost" imprint at extreme far right of a dog that moved while the picture was being taken." "May Plummer is shown here (on left) as a young woman in a Cedar Rapids studio photograph. She was born July 14, 1867 in Linn County, IA, the daughter of Milton B. Plummer and Charlotte Stoneking Plummer. Her father was a Civil War veteran and served in Company I, 20th Regiment, Iowa Infantry as a private. Milton B. Plummer was age 19 and a resident of Cedar Rapids, IA, when he enlisted on August 11, 1862. 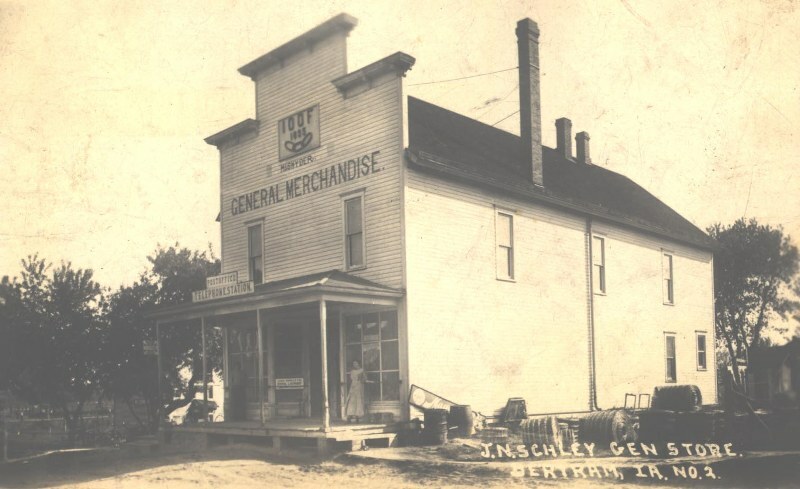 He later became postmaster at Bertram, IA." 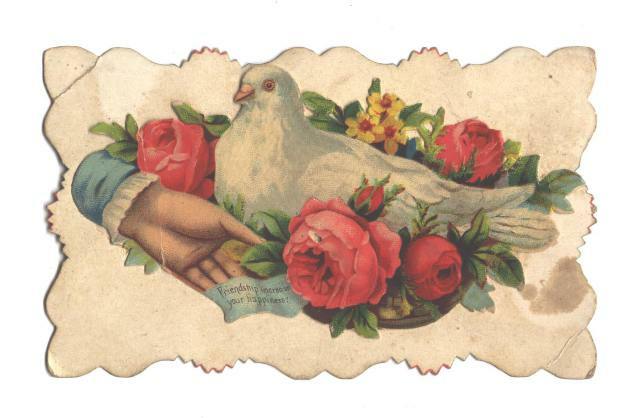 "May Plummer married William A. Burgess, born in 1865 in Memphis, TN, who was to become a Linn County veterinarian. 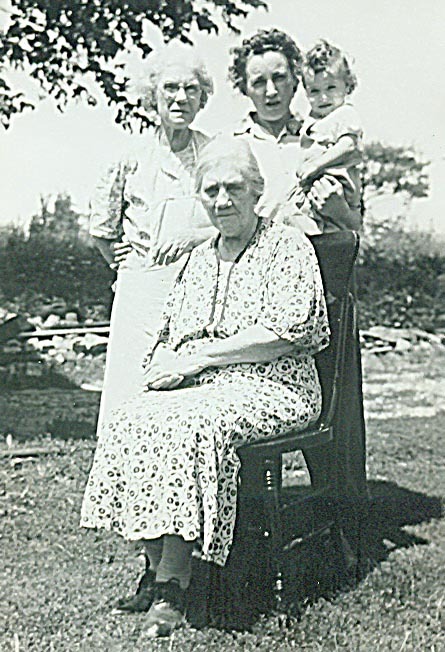 After his untimely death in 1918 at age 62 due to infection, May Burgess remained a housewife and raised their four daughters Alta, Bessie, Edna and Clara, and one son, Earl. May Burgess passed away on December 29, 1960 at age 93 due to complications of old age at the Cedar Rapids' home of her daughter Alta Scott." 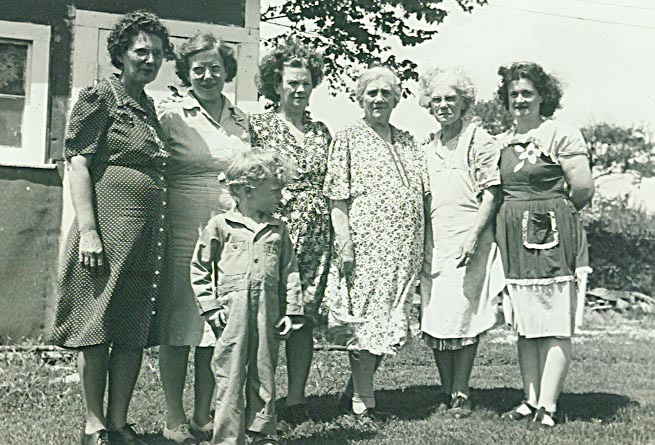 "Life long Linn County resident May Plummer Burgess, seated, is shown here sometime during the late 1940s with four generations of family members. At left is her daughter Alta Grace Burgess Scott and at right is Alta's daughter Edith Scott Williamson. She is holding her brother Harold Scott's grand daughter Patricia Mae Scott." 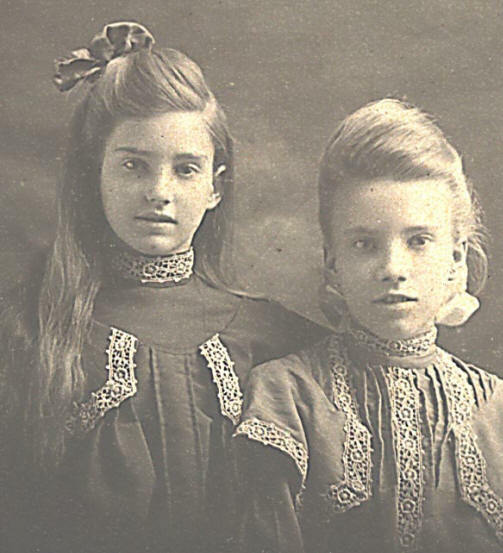 "This studio photograph shows my grandmother Bessie Emily Burgess Zadnichek (right) with her sister Edna May Burgess Todd (May 11, 1894 - July 30, 1979) as young girls growing up in Bertram. Bessie was the oldest by two years and both sisters remained very close throughout their lives. I would imagine that their mother May Plummer Burgess hand sewed each of her daughters' dresses. I would date this image to the early 1900s." The home of Dr. and Mrs. Wm. 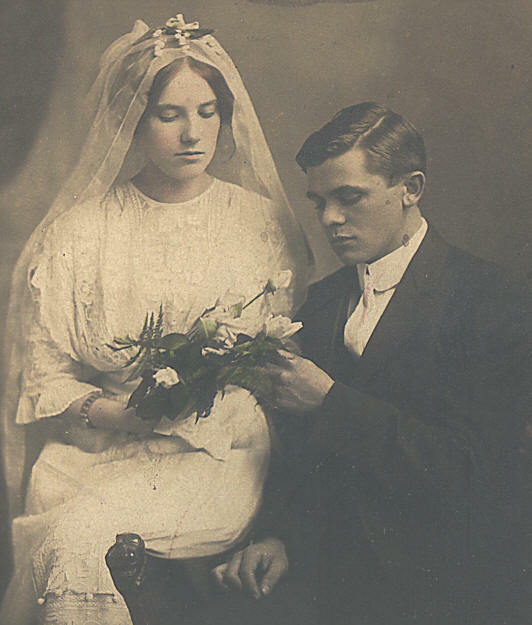 A. Burgess, of Bertram, was the scene of a pretty home wedding last Wednesday evening, October 30th, at five o'clock when they gave their daughter, Miss Bessie, in marriage to Mr. Louis Zadnichek, Jr., of Dundee, Ill. Rev. O.B. Chassell, pastor of the Methodist Episcopal church at Walker, officiated. The ceremony was performed in the presence of relatives only. The rooms were tastily decorated with autumn leaves and pink and white ribbons and roses. And there was a canopy of the former over the dining table. After the ceremony and congratulations the bridal party repaired to the dining room where a sumptuous wedding supper was served. The table was presided over by the venerable grandfather of the bride, M.B. Plummer, and the waiters were Miss Laura Plummer and Miss Edna Burgess, both dressed in white. The bride was beautifully attired in a princess gown of fillet and carried a bouquet of bride's roses and lillies of the valley. The groom wore the conventional black. The bride has been reared from childhood in Bertram and is a charming young woman, well equipped to preside over a home. The groom is the second son of Mr. Louis Zadnichek, of Dundee, Ill., and holds a responsible position with the C. & N. W. R. R. as operator at DeKalb, Ill., where the happy young couple will begin house keeping in a short time. The out of town guests at the wedding were Mrs. Louis Zadnichek, Sr., of Dundee, Ill., and Miss Bessie Zadnichek, sister of the groom. Also the sister of the bride, Mrs. A.M. Safely, husband and two daughters, of Cedar Rapids, Iowa. My grandparents were married 42 years at the time of my grandfathers death in 1954 of a heart attack. Louis Frank Zadnichek was agent in Racine, WI, for the C&NW Railroad and had 46 years of service at the time of his passing.